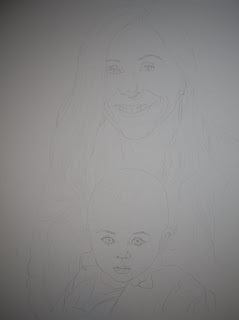 I have transferred the initial sketch to the watercolor paper and refined the details more for both the mother and son. Some areas of the graphite appear quite dark but the lines lift easily with a soft eraser if they don't dissolve during the painting process. Hi Tracey, Its looking super already. Cant wait to see your progress! I decided to draw more of the details on for this one so they are "worked out" right from the start rather than working out more as I go with the brush. I am curious to see if it makes any difference with the end result or the process. I think it will be more relaxing painting as I already know many of the details are worked out so I can just have more fun with the paint stage!